Rick is seen speaking with an unknown individual. Rick tells them how the communities have come together and are thriving. The communities are thirty days into the construction of a bridge which will open up trade access amongst the communities. , Rick learns that they are losing Savior workers, who haven't been returning to work. Henry brings a jug of water to the workers on the bridge, but when Henry tries to stop Justin -- one of the Saviors -- from taking more than his fair share, Henry is shoved to the ground. In retaliation, Henry uses his staff to trip and embarrass the Savior. When he attempts to go after Henry, Daryl interferes and the two end up in a brawl. Rick breaks up the fight and Daryl becomes livid when Rick fails to enact any repercussions since Rick can't afford to lose any more workers. Scouts learn that a herd is approaching the work area, and they set up outposts with sirens to lead them away. The first siren is set off, but the second one fails to sound, which sends the herd right into the workers. Rick and the group are able to tak eout the herd, but Aaron is seriously injured and his arm ends up having to be amputated. Michonne heads to Hilltop and speak to Maggie, who has imprisoned Earl after his attempt on her life. Michonne warns of issues that could arise from keeping the communities farmer locked up. Maggie later speaks with Earl, and after being able to relate his life to her own late father Hershel's, Maggie decides to release Earl under strict supervision and have him return to his farming duties. Rick confronts Justin, who was in charge of the second siren, believing that he deliberately sabotaged their plan. 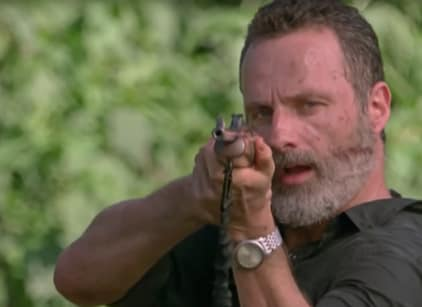 Finally fed up with putting the others in danger, Rick orders him to head back to the Sanctuary. On his walk back to the Sanctuary, Justin is confronted and attacked by an unseen individual. The man that Rick had been speaking to earlier is revealed to be Negan. When Negan asks when he'll get to see what Rick's built, Rick tells him that he never will, and will die in his cell. You're not saving the world Rick, you're just getting it ready for me. Permalink: You're not saving the world Rick, you're just getting it ready for me. Some people can be redeemed, and others can't. Permalink: Some people can be redeemed, and others can't.